Luxury vinyl floors so beautifully textured feeling is believing. There is more to selecting flooring for a commercial space such as a department store, a school or a studio than simply aesthetics, important as this is. Just some of the selection criteria that should be considered include quality, durability, safety, hygiene, ease of cleaning, cost, as well as the increasingly important eco-responsibility. 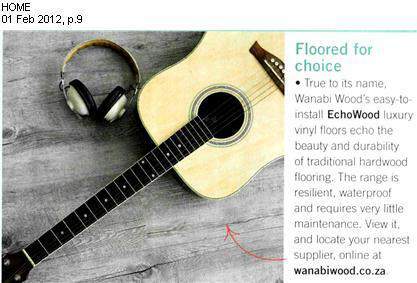 Building on a 30-year history of innovation, Wanabi Wood has found the all-round solution: EchoWood luxury sustainable vinyl flooring solutions, which meet all the criteria for selecting a highly functional flooring solution. The new EchoWood range brings the beauty and elegance of natural hardwood flooring into your corporate and retail spaces, without impacting the sustainability of our forests and environment. It is available in a range of style and colour options - from the natural beauty of antique wood to a rustic look � as well as three different levels of texture and three levels of shine or matt finish � to ensure the perfect aesthetic enhancement for any décor. The very latest manufacturing processes ensure the highest quality, including uniform colour, while an unsurpassed dedication to quality management practices has been recognised by the International Organisation for Standardisation (ISO 9001). With exceptional quality comes durability, but the EchoWood range goes further: the planks are manufactured with a unique surface treatment that gives it superior stain resistance properties and provides greater durability to withstand high foot traffic in even the busiest areas. This same unique surface treatment also provides superior anti-slip properties, which addresses the crucial safety issues in commercial spaces. Associated with the safety aspect is the health and hygiene issue, but again the EchoWood range exceeds expectations. The infusion of nano-sized silver particles - the world�s oldest anti-microbial element � makes the EchoWood product range the first floor that �cleans up after itself�. This �self-defence� technology prevents the build-up of harmful bacteria, viruses and mould to minimise the risk of infections, disease and illness, and ensures easy cleaning. Because the waterproof EchoWood range requires limited maintenance, which translates into less water, fewer chemicals and less energy, your company�s maintenance costs, as well as its environmental impact, are reduced significantly. But the eco-responsibility of EchoWood goes far beyond this, resulting in a truly sustainable flooring alternative that is 100% recyclable and certified as a sustainably green product by the Green Building Council. The EchoWood flooring range is made from 67% post-consumer waste vinyl, while the backing - which makes up the bulk of the flooring - comprises of between 2-5% post industrial content from the manufacturing excess. To minimise the product�s lifecycle cost, the flooring is designed through an environmentally-friendly process, encompassing an energy efficient and smart water management system, which qualifies under the Leadership in Energy and Environmental Design (LEED®) for its sustainable use of rapidly renewable materials and pre-consumer waste stream materials. Cost-effective and easy to install, this exceptional flooring range is not only the perfect eco-responsible alternative to traditional hardwood flooring, but through a number of innovative and industry leading firsts, including the use of nano-technology and a unique surface treatment, also meets every other criteria for selecting sustainable flooring. EchoWood�s range of products is imported and supplied to retailers and shops nationally by Wanabi Wood, which focuses exclusively on quality green products. Available in boxes of 19 planks measuring 3mmx184x950mm in size, the flooring can also be ordered in large quantities, subject to a two-week production period and four to six weeks shipping time. For stockist details or for more information about Wanabi Wood�s EchoWood Vinyl Luxury range visit Wanabi Wood at www.wanabiwood.co.za or alternatively contact Renalde on 0796971833. No trees were harmed during the manufacturing of the planks! This range of products are composed of recycled materials. That level of post-consumer waste alone contributes to LEED credits for Green Building Council designation. The factory is energy efficient, uses smart water management and produces our carbon footprint and emissions if you care about the planet. The first floors that cleans up after themselves "Self defense"
This product range are impregnated with nano-sized particles of the world's oldest anti-microbial element-silver. These nano-silver molecules are so small you can't see them with the naked eye, but they prevent infestations of bacteria, viruses and molds. These micro-organisms languish and die on contact with flooring. This anti-microbial shield prevents odors caused by flourishing bacteria and mold. Flooring that doesn't just lay there, but fight back could be a decisive benefit for hospitals, nursing homes, restaurants, stores and public facilities - any place that wants to minimize risk of infections, disease and illness. You still have to clean this product range to preserve their beauty, but even that is easier.